StratEdge molded ceramic packages come in over 200 standard outlines, dramatically increasing the packaging options for GaN devices, the company reported. 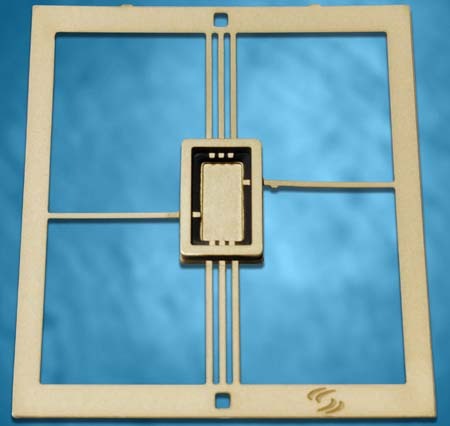 Photo courtesy of StratEdge Corp.
SAN DIEGO, Calif.–Off-the-shelf molded ceramic packages from StratEdge Corporation can be configured to meet the requirements for chips with frequencies up to 18 GHz, including gallium nitride (GaN) devices, StratEdge announced recently. StratEdge (www.stratedge.com) designs and manufactures high-performance semiconductor packages and provides chip assembly and test services at its ISO 9001:2008 certified headquarters facility in Santee, California. The semiconductor packages are used for microwave, millimeter-wave, and high speed digital devices. StratEdge molded ceramic packages come in over 200 standard outlines, dramatically increasing the packaging options for GaN devices, the company said in a press release. StratEdge also offers automated assembly and test services–including gold-tin solder die attach–for the packages. GaN devices are traditionally packaged in StratEdge's LL family of high-power laminate copper-moly-copper (CMC) base packages with a ratio of 1:3:1 CMC. These packages accommodate frequencies up to 63GHz. In the molded ceramic package, the standard Kovar® base can be replaced with CMC. For frequencies of 18 GHz or less, the use of a molded ceramic package provides the advantages of hermeticity, a broad array of outline packages, and lower cost. At the same time, the CMC provides the heat dissipation needed for GaN devices to meet requirements for aerospace applications. For surface mount technology (SMT) applications, these packages can be manufactured with gull-wing formed leads. They offer flexibility because it's inexpensive to change the lead design to match an existing footprint. "StratEdge has hundreds of molded ceramic MC Series packages in standard, open-tooled configurations, which are all MIL-STD hermetic," said Tim Going, StratEdge president, in the press release. "By swapping out their bases with CMC, you get a low-cost, high-power, fully hermetic packaging solution."